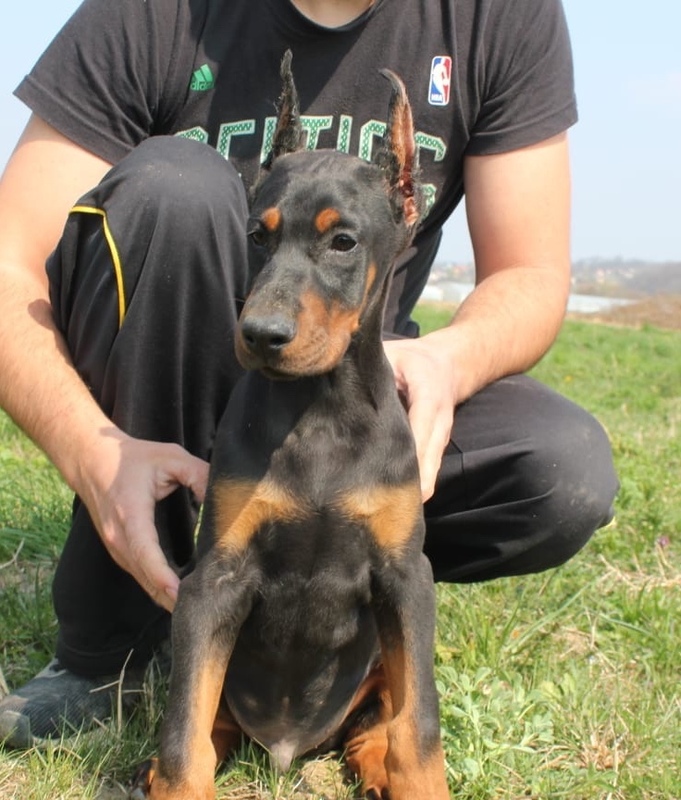 Doberman Forum : Doberman Breed Dog Forums > Doberman Specific Chat > Puppy Corner > Axel is on his way!! Beaumont67, ECIN and gamermouse0213 like this. APRIL 29th ??????????????????????? Oh crap ! That is a Double Eternity !!!!!!!!!!!!!!!!!! I remember very well about them eternities ! We counted down the days till Mr. Business - then got a call from the breeder that is bad sister had bite his poor little tail and opened it up and she wanted to be 100% sure he was healed up before we picked him up - now that was a big downer ! “Don’t open your eyes! Don’t move!” – my first thoughts as I was laying in my bed at the crack of dawn, woken up by my dog staring at me. My European Doberman came in to check if today, for some unknown reasons, I would decide to get up earlier. He wouldn’t want to miss this celebratory moment. So, I lay still and know if I look asleep convincingly enough – he will go back to his bed and I can enjoy another hour in bed before my alarm clock goes off at 7am. That’s the beginning of a day in the life with a European Doberman. My dog lives in the living room. We try to keep the bedroom off limits, but the bedroom door is always opened at night in case he has an emergency. When he was younger, he used to check on me in the middle of the night quite often. At first I thought he needed to pee. So, I jumped out of bed and rushed him outside. The following night he did the same. The night after – he woke me up twice per night! I began to worry: he might be getting a urinary tract infection or something. But it only happened at night. Turned out he was happy to go out with me in the middle of the night – he thought night walks are our new routine! He is older now. I think he is gradually giving up on the idea to get me out of bed in the middle of the night just for fun. But he still tries occasionally. 7:00 am sharp. The alarm goes off. My dog is already in the position – by my bed – waiting for my hand to extend from under the blanket to hit the snooze button. At that moment he licks my hand, stretches and yawns loudly, indicating his presence. “Ignore it” – I’m thinking – “I can stay in bed another 6 minutes before alarm goes off again”. He knows that. He knows that he has 6 more minutes to establish his presence and to keep me semi-awake. If I fall asleep again it will delay the beginning of a new day, and he can’t allow this to happen. So, he lays down by the bed and makes various annoying noises – sighs loudly, licks himself, stretches, yawns, rolls on his back. 6 minutes later alarm goes off again. I open one eye and see his black wet nose nearly in my eye. His nose gently pokes me on the forehead. I have no choice but to start moving. That’s when the celebratory yawn and bark starts. “She is awake! We are going to do something! Yeah!” – you can read this on his face. I slowly get up from the bed. The dog is jumping, licking my toes and hands, swirling in front of me, and leading the way to the bathroom. I go on the toilet. He respects my privacy – he lays quietly on my feet. If I dose off – he sticks his wet nose in my ear or licks my toes. There is no going back to sleep at that point. I move on to the sink to brush my teeth. He lays on my feet again. I reach out for clothing to get dressed. His nose inspects every piece of clothing I take. This is a very important moment for him as he learns what we will do next. Depending on which clothing I put on in the morning – he learns if it’s a regular work-at-home day, of if it’s a day when we go tracking and training in the morning. I take him out for a bathroom break, but he is not that interested in it. So he rushes it and we go back to the house and into the kitchen. He is not allowed in the kitchen, so he settles in the hallway by the living room, where he can clearly see everything that is going on in the kitchen. I prepare his food and he knows it means we are not going training. When I bring out his bowl of food he looks excited! One might think this dog was never been fed before. I take him for a potty break or a short walk around the block after breakfast. His morning routine is completed. I – work, he – stays on the patio. At about 1:30pm (I work at home) I can hear slight “whistling” noise on the patio. “Must be lunch time” – I’m thinking. 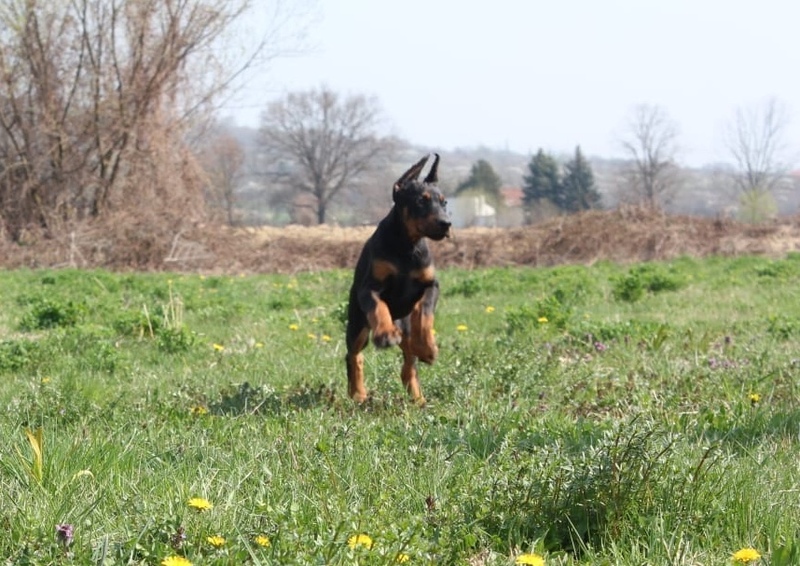 My European Doberman reminds me it’s his time now and I have to come out. As I approach the glass door to the patio, my dog is jumping up in the air, making vocal noise. He is picking different toys, trying to decide which one I might like to play with. When I’m by the door – he is standing by the door with one of the toys in his mouth and you can see his tiny little tail moving left-right, left-right. It makes me smile. I go back to work. My European Doberman lays quietly in his bed next to my desk. On the days when we go to the park during the day – my dog lets me work till his dinner time. On the days when lunch break is not so exciting – my dog’s inner alarm goes off at 5pm. If he is in the office with me – he starts nudging me, pawing at me, puts his head on the keyboard, whines. If he is on the patio – he starts marching in front of the office window, brings his toys and throws them at the window, and whines. I can usually stretch this for half an hour more, but I know – it’s time to wrap up work. He needs to do something exciting every day. If we didn’t go to the park during lunch, there is no skipping evening exercise. I usually go training with him to the club, or in the park. On a bad weather day – he might settle for a walk around the block or a jogging on a treadmill. Evenings are his favorites. May be because the day is nearly completed, everybody’s home, and the routine is very predictable. Evenings are family time and my dog surely thinks he is a center piece of our family. He follows me around in the house like a shadow, he eats his dinner, he gets to watch us eat, he might sneak in a toy in the house and someone might play tug with him. He is happy – he gets lots of attention or, perhaps, just enjoys being a part of the family. 10 pm – last bathroom break. He is excited to go out and air scent the wildlife that is hiding in the bushes down on the property. We go back inside. He goes to his bed and I tuck him in. I go to bed, too. Five minutes later I hear him coming in to check on me. “Don’t open your eyes! 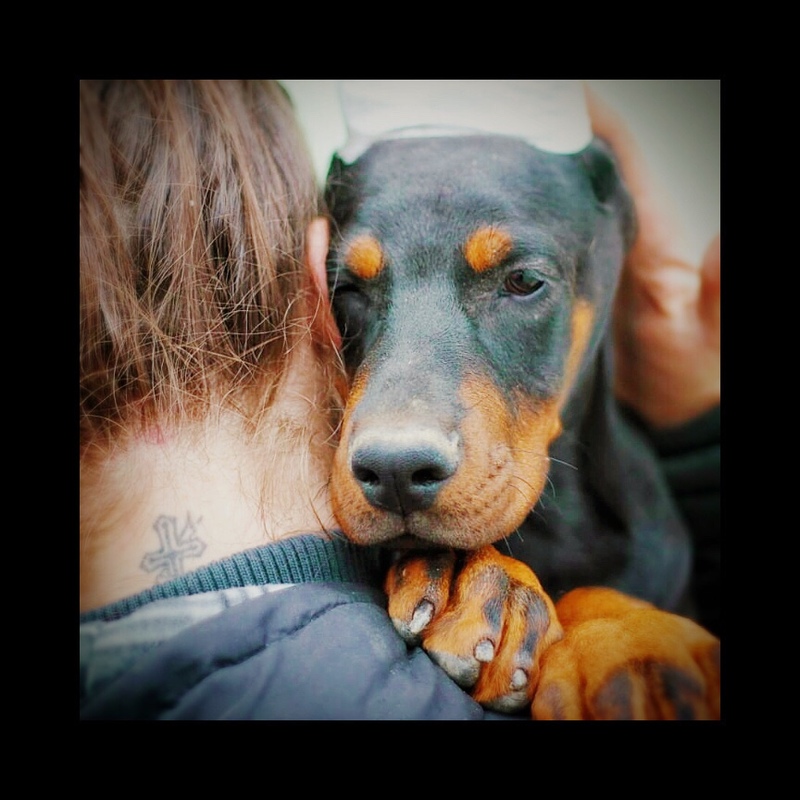 Don’t move!” – another wonderful day in the life with a European Doberman is completed! Beaumont67, 4x4bike ped and ECIN like this. Hoss is so much like what this article illustrates! Just love these pups so much! And congrats to the new addition coming soon ! I can hardly wait to hear all the stories...........suspect it's time to do some pre shopping for Axel!!!! Gotta get one of the "kong classics" ......they come in different sizes .........great for freezing treats during evening time.......toughest toy ever!!! Yes, oksanna Bovt and her boy Nitro. Well did Axel get to you!?! I think April 29th is the day. As you can imagine time is going very slowly and we are counting down the days until he arrives! Coco Loco, ECIN and gamermouse0213 like this. And yes, I can imagine days roll by quite slowly for you right now. Well... That's about to change in three weeks LOL. Cute Axel........we are all waiting for you ...........please hurry to your forever home !!!!!! Its dated about one week ago...........a new member to this forum from the UK....... trying to get more info as they begin their search for a Euro. 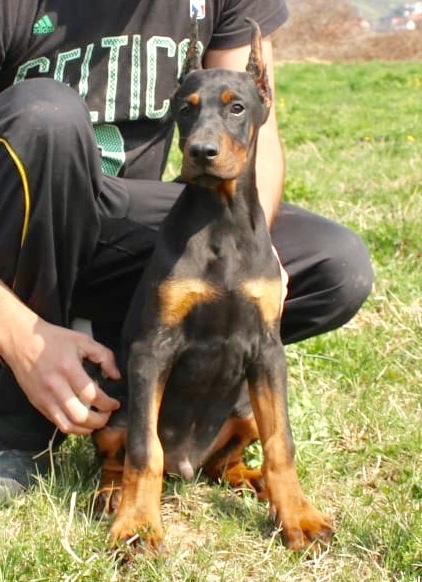 Doberman.........maybe you can assist with some of the things that you learned during your process of finding Axel. What a sweet baby. He looks sleepy in that pic. But it's a trick lol. So much energy when you're tired!! Sleep while you can like LadyDi said!! Sugars sister is coming over tonight for 2 nights. Wtf was I thinking?! This is a inside joke LA between us Dober Parents . Wonder which one will be your first ? 1. Help ! Axel is a pooping fool ! Let him out to potty and he runs back in and poops under the table ! 2. Help ! Axel is a peeing fool ! Let him out to potty , which he did and then he cam in and peed on my foot ! 3. Help ! Axel is biting me and have blood everywhere = what is known as Dobershark ! 4. Help ! Axel gets up all night long ! 5. Help ! Axel is a chewing fool ! HE chewed up my new Ipad then peed on it ! 6. Help ! I think I'm going nuts ! dobebug, Coco Loco, CRDobe and 1 others like this. Help......Axel was doing "zoomies" .........and took out my right knee! Check back with us on April 30 to let us know how its going. When these guys grow up they are the best dogs!! 4x4bike ped, ECIN and Louise&Aaron like this. Hi, I did answer your earlier post. I was enquiring about the broker in the UK you contacted. It wouldn't of been cropped and docked Dobermans owned by Peter Harman by any chance? I did ask the couple about the origin of their new puppy. I am aware of the kennels ( brutal dragons) I did enquire about the broker they had contacted in the UK but unfortunately I have heard nothing in reply. I thought I might have some information for them regarding brutal dragons. Yes it was. He didn’t give me a good feeling and wouldn’t answer my questions. That's really strange. I spoke to Harman early last year and he was very open with me. He informed me that he only has the imported puppies for a very short time after they arrive,basically a matter of days. He is predominantly a business man. He went as far as informing me which breeder he deals with,which incidentally is the breeder you have purchased your future puppy from. 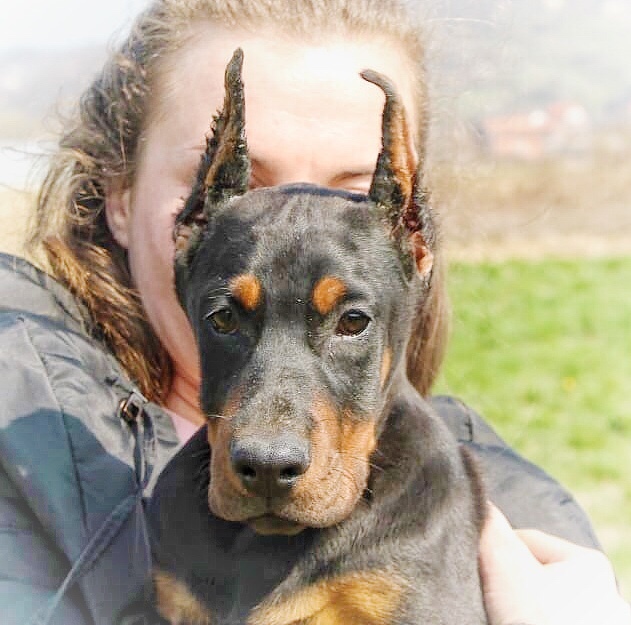 I decided almost immediately to take my search elsewhere.Nearly all of his past sales of puppies descend from the sire libero diamond Stam from brutal. Forgive me if I have provided an incorrect spelling.